French Bulldog Characteristics: The spirited and stoic French Bulldog is a breed of small dog classified as a member of the Non Sporting Dog Group (AKC:1898). The French Bulldog, is characterized by its strong, sturdy appearance with its distinctive "bat ears" and bowed front legs. It has a flat, well-proportioned head and a somewhat whimsical expression. Other characteristics include dark, medium sized, round eyes; elongated ears bat-like ears: a broad back and a vigorous gait. The temperament of the French Bulldog can be described as Lively, Affectionate, Patient. The coat type of the French Bulldog is described as short, fine, smooth coat in assorted colors. Due to its characteristics and qualities, the French Bulldog demonstrated the desired traits of a Ratter and Lapdog and is known by its nick name the "Toy Bulldog". The origin of the French Bulldog breed was in France where it was developed in the 1800's. French Bulldog Breed Group and Dog Type - Non Sporting Dog Group (AKC:1898): The French Bulldog is one of the many breeds of dogs that belong to the Non Sporting Dog Group (AKC:1898). Origin of the name: The origin of the word 'Bulldog' is derived from its original use as a 'bull baiter'. Bull baiting was a contest in which trained bulldogs attacked tethered bulls. Any dogs with the word 'Bull' in its name were originally used in Bull baiting. French Bulldog History and Origin: The country of origin of the French Bulldog breed was in France during the 1800's. The French Bulldog was cross breed dog bred from small British Bulldogs and the Bull Terrier that were imported from England and the French ratters. The French Bulldog was developed to hunt rats and other vermin that plagued the houses, docks and storehouse of all the major French cities. The breed, that became known as the French Bulldog, was first brought to France in the 1850's by the constant flow of migrant laceworkers from the English city of Nottingham to the coast towns of Normandy, where lace factories were emerging. The laceworkers frequently took their dogs with them and these British Bulldog types were the ancestors of the French Bulldog. 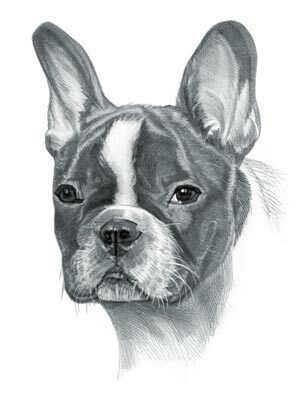 As the breed developed the main difference between the French Bulldog and its British ancestors was that the ears of the French dogs were set higher on the head and held erect. The little bat-eared French Bulldog received recognition as a distinct breed under the name of the 'Bouledogues Francais'. The breed became highly popular with the cafe owners in Paris and were also favorites of Parisian streetwalkers. The 'Bouledogues Francais', or the French Bulldog, was depicted in a famous lithograph called 'At the Hanneton' by the French artist Henri de Toulouse Lautrec (1864 ? 1901). The French Bulldog attracted the attention of American tourists in Paris who took some the dogs home with them. The French Bull Dog Club of America was formed who drew up a French Bulldog breed standard that allowed only the famous bat ears. There was a furore at the 1898 Westminster Kennel Club show at Madison Square Garden as Americans were outraged to find that classes for both bat-eared and rose-eared varieties of the French Bulldog were allowed. They declined to display their dogs and the American Judge refused to participate in the show. The French Bull Dog Club of America organized their own show, for bat-eared dogs only, to be held at the luxurious Waldorf-Astoria (the venue reflected the status of the wealthy French Bulldog owners). The French Bulldog was officially recognized by the American Kennel Club (AKC) in 1898. French Bulldog Height: The French Bulldog breed is classified as a small sized dog. The height to the shoulder of a male dog is 11 to 12 inches . The height to the shoulder of a female dog is slightly less. French Bulldog Weight: The weight of this small sized dog, in a male dog is 20 to 28 pounds. The weight of the smaller female dog is slightly less than the male. French Bulldog Coat Type - LOW shedding coat: The coat type is described as a short, fine, smooth coat. Many French Bulldogs have a Melanistic Mask (a dark coloration of the skin or hair typically on the muzzle and face of the dog) because of a high concentration of melanin. French Bulldog Coat Colors: The colors of this dog breed consist of assorted colors consisting of White, Fawn, Brindle, Cream, Tan, Brindle & White and Black Brindle. N.B. Brindle is a brownish or tawny color. French Bulldog Grooming - LOW Grooming Needs: The dog grooming needs of the French Bulldog are categorized as Low in order to maintain a healthy coat and reduce the risk of skin infections. The limited dog grooming needs of the French Bulldog are therefore considered to be low maintenance, requiring limited attention to grooming with casual brushing and combing. Dog Grooming needs should also include bathing the dog on a monthly basis and making regular inspections of the eyes, ears, nails and teeth. French Bulldog Litter Size: The litter size of this dog breed ranges from 3-5 puppies. French Bulldog puppies for sale can be obtained reputable breeders and from rescue centers. The cost of French Bulldog puppies varies depending on location, pedigree history and the dog breeder. French Bulldog Temperament and personality: The temperament and personality of this popular dog breed is described as Spirited, Lively, Affectionate, Patient and Stoic. French Bulldog Exercise Requirements - LOW Exercise Requirements: The exercise requirements of this breed of dog is low. The French Bulldog requires regular daily exercise consisting of approximately 30 minutes to one hour every day. This small dog has a lively vigorous gait with small strides and only requires a fairly slow speed by the owner to meet the dogs exercise requirements. Remember that it would take a lot of extra steps by your dog to keep up with your normal walking pace. French Bulldog Diet: A fully grown French Bulldog should be fed twice a day. A diet consisting of a premium dog food can be balanced with fresh food eaten by the family. The question is What Can Dogs Eat?. Check out our comprehensive list of what dogs can and what dogs cannot eat. French Bulldog Health Problems: Potential health problems of the French Bulldog breed include Cataracts, Breathing difficulties, Cataracts . Resolving health problems can prove to be expensive and it is always wise to obtain pet insurance or dog health insurance when buying a dog. Is the French Bulldog breed said to be Hypoallergenic? Answer: No. French Bulldog Lifespan: The life expectancy of dogs vary according to the size, breed of dog and any serious health problems. The typical lifespan of the French Bulldog breed is 9-11 years. French Bulldog Male Dog Names: Male Dog names are most often chosen to reflect favorite names of the owner or the strength, size, coloring and country of origin of the French Bulldog breed. To give you some inspiration regarding good male French Bulldog names our small selection might be of help with naming boy dogs. Our top male dog names are: Fabien *** Beaufort *** Francois *** Gaspard *** Lucien *** Marceau *** Jesse *** Jagger *** Maximus *** Buster. French Bulldog Female Dog Names: Female Dog names tend to be softer, prettier and reflect the temperament of the girl dog. Our top choice of good female French Bulldog names are Bernadette *** Cherine *** Renee *** Richelle *** Suzette *** Joelle *** Lisette *** Violetta *** Yvette *** Tasha *** Baby.